Intervention at the foot of Pariacaca, a glacier located in the central Andes between the provinces of Lima and Junin. The Pariacaca glacier feeds Lima’s four major rivers and is the city’s most important source of water for agriculture, electricity generation and potable water. Peru has the largest concentration of tropical glaciers in the world and these are considered some of the most vulnerable regions under threat from global warming. 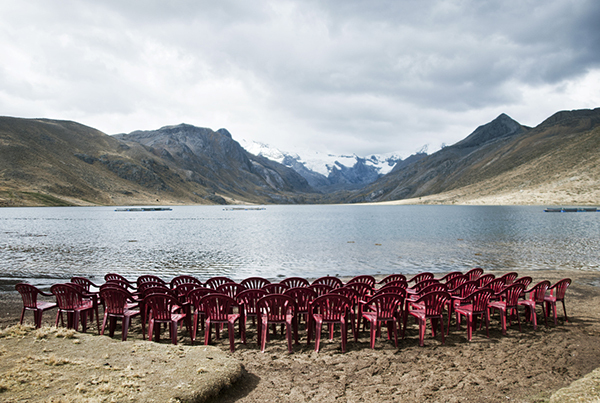 Chairs from the assembly of the Tanta peasants community in Yauyos region were placed to stage an empty auditorium. While the world leaders gather to negotiate in the capital’s convention center, the real melting planet remains unattended.